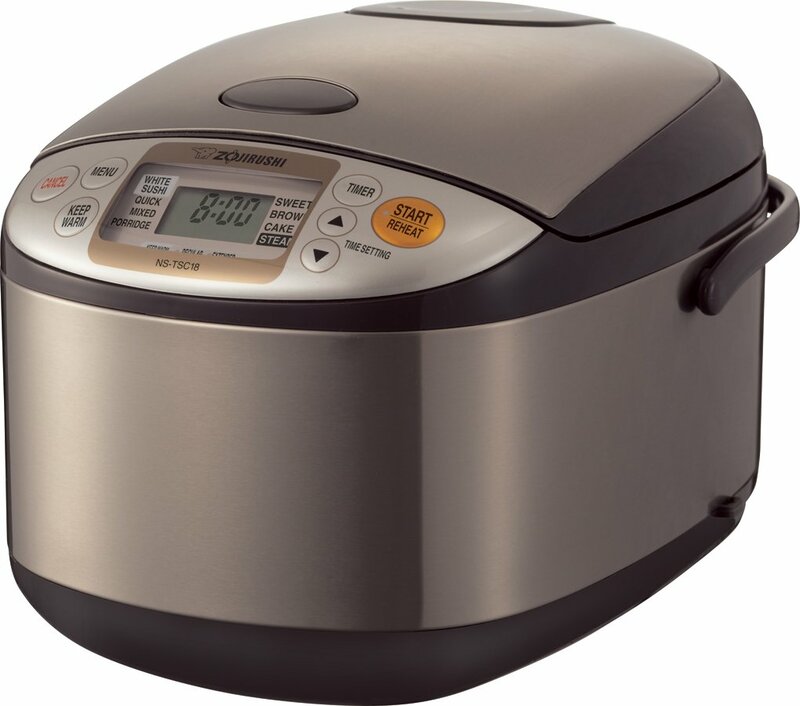 This Micom rice cooker and warmer by Zojirushi is a high quality rice cooker, warmer and steamer. This rice cooker can make any type of rice perfectly, and it can keep it warm and tasty all day, or overnight. If you want superbly cooked rice, the Micom is a great buy. This 820 watt rice cooker can cook 10 cups of uncooked rice (20 cups of cooked rice) in a pretty compact space. The rice cooker measures 11.1 by 15 by 9.9 inches and weighs 11.9 lbs, so it won’t take up a lot of space on your counter. This Micom rice cooker is made with a clear-coated, stainless steel exterior. This exterior is not only easy to clean, along with the detachable inner lid, BPA free steaming basket and thick inner cooking pan, but it looks great in any kitchen. It also has an easy to read LCD control panel with clock and timer functions. In addition, this rice cooker comes with a retractable power cord to make storage and set up a breeze. With the help of microchip technology, this rice cooker can take your rice to a whole new level. The rice cooker is able to adjust cooking times and temperatures based upon the type of rice you’re cooking. It can even time the presoaking of raw grains, and the final wait time when you are steaming something. Accessories include a nonstick rice spatula, spatula holder and rice measuring cup. This rice cooker can really do it all. You can cook absolutely any kind of rice in this great cooker. White rice, brown rice, sushi rice, mixed rice and porridge are all cooked to perfection in this rice cooker, but it’s usefulness doesn’t just stop there. 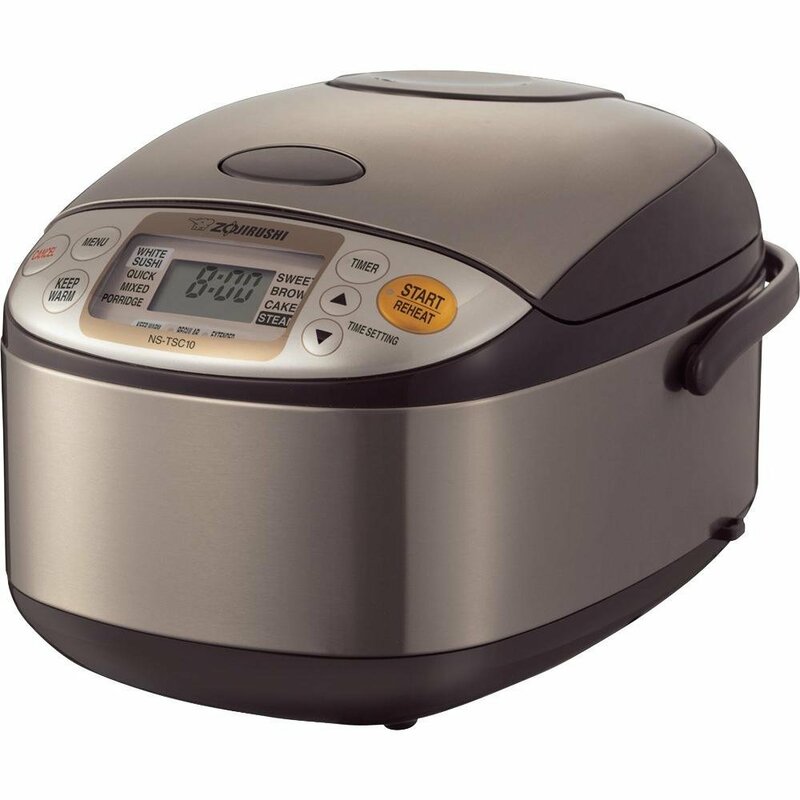 This rice cooker can also be used as a steamer for other types of food, and you can even make cakes in it. There are even more cooking suggestions written in the reviews on Amazon. The NS-TSC18 Micom rice cooker is a great purchase if you’re looking for a high quality appliance that can cook perfect rice. Between the number of uses and easy cleanup and operation, this rice cooker is well worth the money.